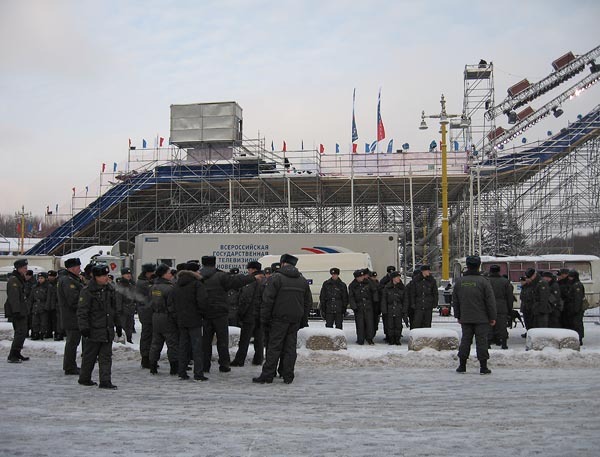 Moscow hosted the last stop of the Fis Big Air tour this season. The weekend there was incredible. After seeing the red square in the city, the metro and other bits of the town, Moscow moved up into my top 3 cities overall! Maybe the female population of Moscow might have contributed to my conclusion as well. The competition itself took place in front of a very nice backdrop. The ramp was built right in front of the biggest university of Moscow. At night with all the spectators and the lights this was a very special scene. At pretty cold temperatures around -20° celsius the two Finnish riders Peetu Piiroinen and Jaako Ruha dominated again. I rode solid and ended up as 5th. Jaako kicked me out in the semi finals with a big backside 1080. Despite that we were freezing a lot and that it was hard to find food, I took home some really nice impressions from Moscow. Yeah ... I am a fan of Russia now! Fs 540 melon during the contest. russian soldiers... maybe they snowboard as well. maybe not.